Birzebbuga is located in 'the South' as the Maltese call it, but it's actually the South East of the Island. 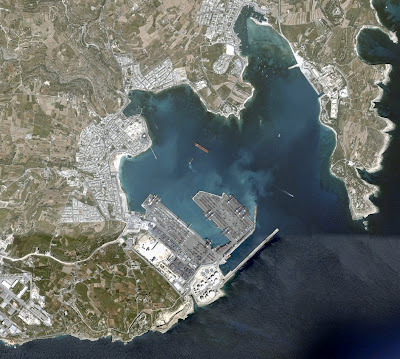 The image below is of the port areas of the 'South'. The bay to the North East of the large harbor area is the fishing village of Marsaxlokk, further South and to the West is Birzebbuga. The reason I find this area of interest is because it is somewhat ignored or forgotten by the general Maltese public, so many Maltese people hardly ever venture to the South - which is incredible considering the island is only 27 km at its longest. Like the rest of Malta it has undergone much change, it is dense with layer upon layer of Mediterranean history: It is rich in pre-historic settlements and Megalithic Temples. It was the first place to be inhabited by the Phoenicians. Houses the remains of a Roman Villa. Is scattered with fortifications built by the Knights and later other built by the British. It was the site of a British Military Base and so the village transformed into a center full of the bars and entertainment necessary to keep the Naval officers happy. The area has continued to have layers and functions placed over it since the island's independence and through having much industry thrown its way. And more recently the area has seen a massive influx of assylum seekers due to the positioning of the Immigration Detention Facilities.